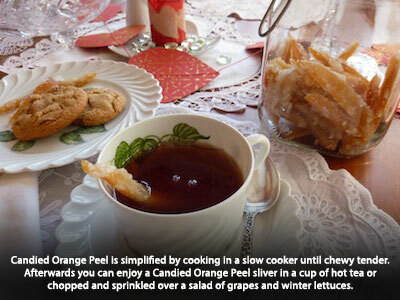 Candied Orange Peel is a seasonal treat. Southern food historian Damon Lee Fowler of Savannah, Ga., shared his recipe for Simple Candied Orange Peel with Bon Appétit magazine in 2008. Fowler noted that Candied Orange Peel was a special treat at holiday time because families acquired citrus, even when times were hard, to celebrate the season. Since we organically grow oranges, Satsuma’s, Meyer lemons and Persian limes in our yard in Baton Rouge, I usually make a batch or two of candied orange or lemon peels during the holiday season. This year, I didn’t make a December trip to Louisiana so I purchased a bag of Indian River-grown oranges from Florida to use in making ambrosia and candied peel. The Florida oranges were plenty sweet and easy to peel. I basically use Fowler’s recipe, but have adapted it when I don’t have time to stir the pot to a slow cooker preparation method. I also have dried the candied peels in the oven at 200 degrees when my kitchen was too humid to dry the sugared peel. After making Candied Orange Peel, I store it in either an airtight canning jar or in plastic freezer bags in the freezer. I like a sliver with a cup of hot tea and also chopped and added to winter fruit salads. No doubt, you’ll want to make both recipes this weekend – I’m sure. Makes about 2 cups. It takes a day or two for the peel to dry, so plan ahead. Cut peel on each orange into 4 vertical segments. Remove each segment (including white pith) in 1 piece. Cut into ¼-inch-wide strips. Line a rimmed baking sheet with parchment paper. Toss peel with remaining 1 cup of sugar and spread out the sugared peel on the baking sheet, separating the strips. Let stand until sugar is dry, which takes 1 to 2 days. DO AHEAD. Wrap and freeze up to 2 months. Tommy’s Testing Notes: When I don’t have 45 minutes free to stir the pot on the stove, I dump the orange peel and dissolved sugar/water syrup into my slow cooker. Cover, set on LOW and go my merry way. The peel may take 8 hours or more to cook to the tender stage, but does just fine. I also dry the candied peel in a 200-degree oven for 15 minutes when my kitchen is too humid to properly dry the candied peel. The main concern is to remove as much of the white pith as possible when peeling the orange because the pith can be somewhat bitter tasting. Also, since this is kind of labor-intensive, I usually peel about 10 oranges and do a large amount at one time. Increase sugar/water if needed. Sometimes, I freeze the syrup left in the slow cooker after removing the cooked peel. A spoonful of the frozen syrup blended with club soda makes a refreshing orange soda on a hot day. Serves 8 or more. Adapted recipe is from the California Table Grape Commission. Combine the grapes, tomatoes, onion, green onions, bell peppers, cilantro and jalapeno chile in a bowl. Mix well. Combine the lime juice and olive oil in a measuring cup with a whisk. Pour the mixture over the grape mixture and toss to coat. Cover with plastic wrap and chill for at least one hour before serving. Can be held for three or four hours chilled, but the cilantro starts to lose its pungency after four hours. Leftovers served the next day taste fine, just not as spicy. Tommy’s Testing Notes: You can serve Grape Salsa as a dip for sturdy chips or ginger snaps. 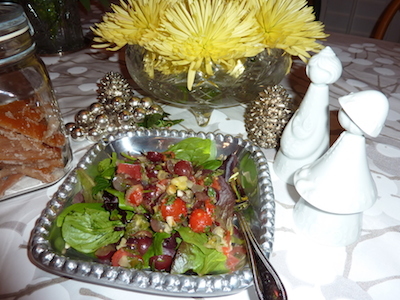 Or, you can serve it atop a bed of assorted lettuces to make a colorful and tasty winter salad. Top the Grape Salsa with an orange juice-sweetened vinaigrette and 2 tablespoons of finely chopped Candied Orange Peel.